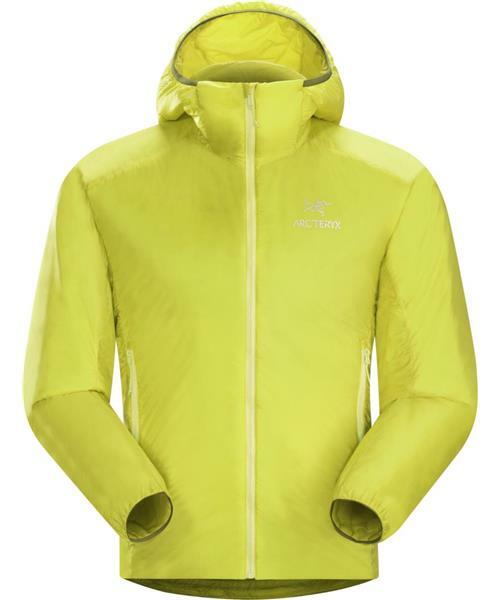 Leveraging the lightweight performance of Coreloft™ synthetic insulation, an ultralight Arato™ nylon shell and highly efficient ergonomic patterning, Arc’teryx created an alpinist’s hooded belay jacket that packs to the size of a water bottle and delivers effective warmth for a mere 290 grams. Articulated patterning and gusseted underarms provide extended mobility without sacrificing coverage. The Arc’teryx Trim fit accommodates light layers, but stays close to the body for a higher level of thermal efficiency, and Arc’teryx e3D (ergonomic 3-Dimensional) patterning utilizes extra space in key joint areas to bring an added level of use specific articulation. With light and compact warmth as the goal, Arc’teryx refined the Nuclei FL’s design. Utilizing different volumes of Coreloft™ insulation helped Arc’teryx reduce weight and bulk without sacrificing effective warmth. Mapping the insulation to place specific weights where they deliver the most appropriate benefit, loftier 80g Coreloft™ in the body places a higher level of warmth where it is needed. Lighter, more compact 60g Coreloft™ insulates the sleeves and side panels to aid air permeability, streamline fit and improve mobility. Disciplined in its design, the Nuclei FL is as streamlined as possible. Simple elastic binding around the cuffs and hood is light, smooth and creates a secure fit. Hand pockets have minimized zippers that stay out of the way of rope and rock. The Nuclei’s internal pocket includes a removable stuff sack with a carabiner clip loop that allows it to be easily fastened to a harness or pack. The Arc’teryx No Slip Zip™ secures the closure with a series of small bumps spaced every twelfth tooth to secure the slider and prevent self opening but still unzips with a single hand for rapid ventilation.